Based on the classic Gibson mandolins that were an innovative breakthrough a century ago, the Eastman MD615 is an F-style, high quality all solid wood instrument. 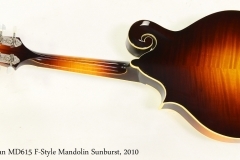 Until Orville Gibson merged the violin and mandolin designs, most European mandolins used a bowl-back design. The shift to an arched top and back design allowed significantly greater strength and volume, with better portability an added plus. Bowl back mandolins have almost disappeared from the North American music scene. The A and F styles, however, have pretty much taken over the Country, Bluegrass and folk music scenes, though there are specialized, flat-back mandolin or bouzouki instruments for the Celtic and Brazilian players. Eastman is a major builder of violin family instruments and it’s a natural fit for them to produce mandolins like the MD615. Solid, nicely figured woods are carved to shape, construction standards are high, and traditional finishes – in this case, nitrocellulose lacquer – are used rather than polyesters. 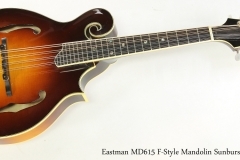 This Eastman MD615 F-Style mandolin dates to 2010 based on its serial number, and is in very clean condition. The top is carved Spruce, and the back is carved Flame Maple. The sides and neck are also Flame Maple, and the bound fingerboard is Ebony. The bridge and head plate are also Ebony. It has a few small chips around the edges, particularly at the top end of the headstock – this is a vulnerable spot for this type of head. For the most part the finish is very clean and unmarked. Fret wear is minor, and the action is good. These are great sounding mandolins. The original Eastman hard shell case is included.